Professional Development and Service – A Recipe for Success | The Pinnacle P.O.V. What do you get when you combine professional development training, 37 MGRM Pinnacle employees and St. Mary’s Food Bank? You get an amazing day of training and service, just like what happened on Thursday, November 17th. 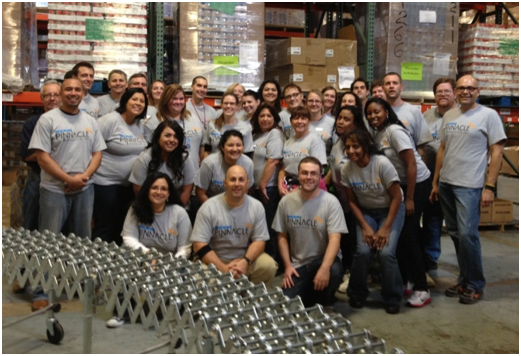 MGRM Pinnacle Education held their professional development training at the St. Mary’s Food Bank in Phoenix, AZ. The morning PD session was filled with team building activities and training . Adam Dregely, Special Education Instructor, led a discussion regarding MGRM Pinnacle’s special education services, and offered several key activities that would help instructors and counselors get students actively engaged within their first 45 days. Kathie Driscoll then led the group through a workshop on grading rubrics designed to improve standards and ultimately improve the academic achievement of our students. Not to be forgotten, the Enrollment and Registration team completed their own professional development activities, around improving their customer service approach to student interactions, after which they joined the rest of the team at St. Mary’s for the community service activity. St. Mary’s Food Bank is part of the St. Mary’s Food Bank Alliance, the world’s first food bank, and this nonprofit organization works to “alleviate hunger by gathering and distributing food to sites that serve the hungry.” MGRM Pinnacle employees rolled up their sleeves, stepped up to the line, and got to work helping to assemble packages of food. Two hours into the activity our team members had assembled more than 1,000 boxes of food which sat waiting for distribution on 17 pallets. That’s more than 20,400 individual meals that St. Mary’s will now be able to ship out. The sense of accomplishment and team work was evident in the faces of each person there. It was obvious that not only had the members of the MGRM Pinnacle Education team gained some valuable tools and knowledge during professional development training that would help them improve the educational experience for their students, they had also contributed to improving lives within their community. At this time of year we would extend the same challenge to you. Find away to improve yourself, and then look for ways to improve the lives of other around you. ~ by azmegan on November 22, 2011.